The Oregonian put out a pretty good list this year and I thought it was a nice resource to have here. and contributes immensely to goodwill and happy companionship. It is of great importance to the morale. I am excited to report that Portland Farmers Market is coming to Northeast Portland. The King Farmers' Market, PFM’s fifth market, will be open 10am to 2pm every Sunday, from May 3 through September 27. It will be in the parking lot next to King School Park - NE 7th and Wygant, a block south of Alberta. Here's a map: http://www.portlandf...ay_King_Mkt.php. The King Market will feature 45 vendors, offering the best of what’s fresh in Oregon, as well as local prepared food and live music. The market is a collaboration between Portland Farmers Market and the Northeast Coalition of Neighborhoods. Thanks for the information, traci17, and welcome to the site. Yea! I can't wait. I live nearby, and it's going to be so nice to be able to walk down to the market. I love our neighborhood. Unless it's been canceled, they left out the Multnomah Farmer's Market in the parking lot of the Multnomah Center on Thursday afternoons. This will be the second year for the market and, as did Hillsdale's, the first year was small. We need support to keep the market going - it doesn't interfere with Hillsdale's - in fact the same director Eamon Molloy manages both markets. I'm not sure what happened to the Orenco Farmer's Market, but there was literally 1 vendor selling produce today. The rest were plants, arts & crafts, and seriously perfumy (sorry, YUK!) soaps and soap-like products, and prepared foods. I think there were 3 vendors selling soaps, and a 4th selling lotions. And this is a small market, like Hillsdale. I don't want to be asked if I want to sample lotions. I want to sample fruits and cheeses and other wonderful items for late spring / early summer. I want to smell fresh berries and spring onions and herbs, and other fresh-food floral scents. It was like walking past Bath & Body Works at the mall, where you can smell the store 2 storefronts away. At the mall, all fine & good. But at the farmer's market? I went there today instead of Hillsdale because I saw the Peach man at the Portland market yesterday (I call him the Peach man because he brings in Suncrests in the summer), and he said he'd have cherries at Orenco on Sunday. So we went. He wasn't there, no produce was there. Sorry for the rant. We had brunch at K&Z then dropped our friend at his house in Garden Home, and were less than 5 min from the Hillsdale market but went to Orenco instead to get cherries. Grrrr. I think I've found a decent slice on the West side, and it's at Orenco's Farmer's Market. There's a new vendor, Veraci Pizza. Very thin pies coming out of a small portable wood oven. I found them online: www.veracipizza.com The gal said they were from Bend. I couldn't figure out how, out of all the markets, they chose Hillsboro & Orenco, but I was sure happy for it. It's not up there with Schools, Ken's, Nostrana or Tastebud, but I liked it better than Schmizza or Pizzacato. It's different...very very VERY thin. I think the cheese slice was about 1/4" thick. I'm hopefully going back later with my H and little Ava, if they wake up from nap time before the market closes. I liked the cheese slice. It's kind of hard to describe though. It's a thin layer of red sauce, and a thin layer of cheese, and some herbs. I don't normally like an herby pizza, but this worked. I think they need to leave the pie in the oven another minute or so to get some char on the bottom, but the edges are beautifully chared and the toppings are cooked perfectly. The crust is flavorful and I actually liked it! I was surprised. It's not crispy but it's good fold-in-half-n-eat kind of slice. They also had a pepperoni, and something that looked like basil & a few vegetables on there, and one more that looked like pepperoni, green onion & olive. Interesting. I was frankly shocked. I'll write more if I get back over there in time. They're also at both Saturday & Tuesday's Hillsboro markets. The rest of the market was booming. Unger farms had flats of strawberries, and there were a few other vendors with gorgeous berries. Two vendors with Bing & Ranier cherries, 2 stalls of fresh produce, Ochoas, a BBQ place, oh...and someone making fresh mini donuts. Those were pillowy and lovely. Not at all greasy. Just yeasty and good. So glad to see this little market booming again. Went back to the Veraci Pizza stand at Orenco with H and little Ava. We had a slice of cheese, mushroom, and one had spicy sausage & pepperoncini's. Liked the cheese & mushroom slices, but didn't care for the 3rd one as much because it masked the taste of the cheese and sauce, which I really like on the other 2 kinds. I think this is the best pizza I've had on the West side so far. The slices we had on the 2nd round had more char to them also, which was nice. It didn't make the crust any crispier, but it helped with the taste. Cost was $4/slice for pretty large slices, 1/4 pie. We were happy after a slice each, but could've eaten another slice if it was in front of us. So a whole pie would be $16 - $18, depending on the toppings. I don't know how good this pizza would be to go, I think you have to eat it right there or the light crust would just go soggy. Glad you've got something decent out there.. now if only... Hillsdale, Multnomah Village, Raleigh Hills, the Tron, or Lake O could get something decent. This is a traffic alert for the Beaverton Farmer's Market September 19th. The Beaverton City Parade will be going on that morning and several streets around the farmer's market will be blocked. I thought I'd post this because 2 years ago we didn't know about it and got stuck trying to get out of there for over an hour, gridlock everywhere. The market is between 3rd & 5th on Hall. April showers seem to have brought May showers, no flowers. But May is the month farmers markets begin to bloom. Last Sunday, the Hillsdale Farmers Market began its new season and the King Market opened in Northeast Portland. On Wednesday, the Shemanski Park Market opened downtown. 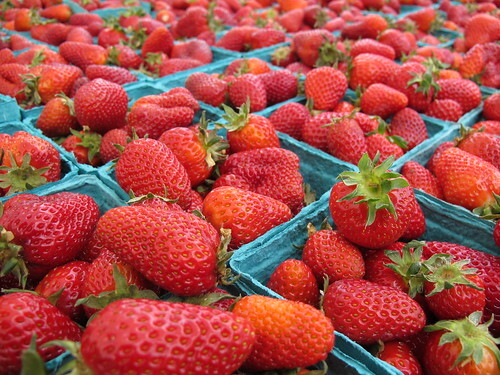 This coming Saturday, the Beaverton Farmers Market opens. And yesterday, the Buckman Farmers Market, formerly known as the Eastbank Farmers Market opened. Strawberries, dandelion greens, pretzel bread, @jenlikestoeat dressed like a pumpkin and @eaterpdx like a tomato. And I took pictures. Beaverton Farmer's Market opens this weekend. New vendors include Olympic Provisions & Tastebud. We'll be hitting up both Beaverton & PSU markets tomorrow morning. Excited! We were at Beaverton at 8AM today and got some wonderful hanging baskets from Stoller farms. I was looking for Olympic Provisions and, while they were on the map, there was someone else (I assume a weekly fill-in) in their spot. Hope they are here later in the season. I got up at 8am, noticed that it started at 8 (I thought it was 9am for some reason) and said screw it. God bless the Hillsdale Farmers Market and a reasonable opening time of 10am on a weekend. We looked for them also but didn't see them. Tastebud was there but they had a small booth that didn't have their trademark wood oven going. They had bagels & sandwich stuff. We got to the Beaverton market around 10:30am and by 11:00am a lot of booths were almost cleared out. The market was stuffed with people, as hard to walk through in some areas as the Portland market with the old layout. And that's a tall order for the Beaverton market because the aisles are incredibly wide. GTF, Deep Roots, Denison & the asparagus guys were the most noticeably sold out. I was most bummed that I didn't get to Denison earlier because they had favas but only a few straggler beans were left by the time I got over there. Only place in the market that has them. I did however get baby orange, red, and chioga beets from them, so that made me quite happy. Also picked up pea shoots, spring garlic, spring onions, tomato plants, herb plants. Denison Farms is my favorite because they always have things that aren't available at the other stalls. Favas (mentioned above), huge long romano beans in the summer which I adore, gigantic runner beans, all kinds of great stuff. I've never had luck growing full size tomatoes though. I do great with cherry varieties, but full-size ones rot on the vine with the cool nights starting in Sept before they get to full size & ready to pick. But I'm going to give it a try, as I LOVE this variety and have never seen it here, either as a start or at any of the booths at the farmer's markets during tomato season. We saw Linda Crab at the Beaverton market but I'm still pissed at them for the bad halibut, so I'm too gun shy to buy from them. I didn't see my favorite fish vendor at Beaverton market though. The 2 guys with the double-wide stall, used to be where Linda Crab is now, but last year they moved to the end of the prepared foods aisle. I hope they're going to show at the market again this year. Really great guys and excellent seafood. After Beaverton we headed over to the PSU market and scored a GREAT parking space, which happens never. I'm loving the fish vendor in the back corner across from Deep Roots. Remarkably fresh fish and the guy knows exactly where he caught everything that's there. The halibut & cod have both been great. We're 3 for 3 on buying from this guy now. Oh, and Amanda, the kombucha folks were there! The French term cuisine du marché translates roughly as “cooking from the market,” and it’s an apt term for how many of us in Portland cook and eat — local, seasonal, spanking fresh. Get to a market early and you can catch some of Portland’s best chefs prowling the aisles for the specials that will grace their menus that week, if not that very day. And there are market chefs such as Mark Doxtader of Tastebud, Chris Douglas of Savory et Sweet and Sophie Rahman of Masala who literally shop the market in the darkness before it opens to gather the ingredients they’ll feature in their stalls later in the morning when shoppers arrive. Food that was picked from the field only hours before, then prepared right before you eat it? For my money that makes Portland’s farmers markets some of the freshest and cheapest places to eat in this food-crazy town. So to bring it all full circle, eat market-fresh food while you shop for ingredients to cook yourself. We’ve scoured the local market scene for the best and the brightest prepared-food vendors at six Portland markets. A word to the wise: Several of those mentioned attend more than one market, so check the market websites for their current vendor lists. Went to Interstate yesterday, and found it a very small market. I think there were holes where farms should have been, since the harvest is coming late this year. It's right across Interstate from the Kaiser parking garage at the park. Had some nice tastes of dry cured sausages from Olympic Provisions, and some very delicious samples of many flavors of granola from newcomer Little Brown Box, Co. I bought a little packet of the cherry gingersnap, and it is very tasty stuff. Got some Hood berries (better than last week's, nowhere near as good as last year's) from Unger (they also had Albions) too. Sweet and flavorful, but still a bit watery, and better than the Albions. Local drinking vinegars? In cherry??? I might have to hit Interstate Farmer's Market next Thursday. I wasn't able to get to Buckman last night. Not much to the website - like where to find her live and in person. YUM!